Attending the Greenfeather Grant presentation on Dec. 14, 2018, were, left to right: Bianca Perito ’19, vice president of Greenfeather; Woody O’Cain, assistant vice president of Alumni and Parent Engagement (kneeling); Hannah Grace Frazier, assistant trainer for My Angel with Paws and 2018 Stetson alumna; Sarah Townsend, executive director of MAWP; Marilyn Kudlets, President of the MAWP Board; Rebecca Thomas, Stetson assistant director of Sustainable Giving and Greenfeather adviser; and Aamani Thulluru ’20, a member of the Greenfeather Committee. Stetson presented this year’s Greenfeather Grant for $19,516.81 to My Angel with Paws on Friday, Dec. 14 – raising almost twice the goal for a local nonprofit that trains dogs to help people with disabilities. 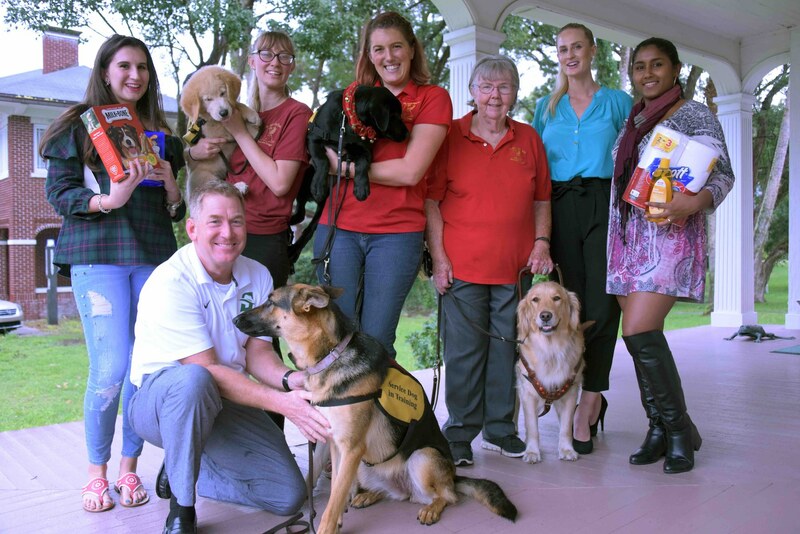 “Holy cow,” exclaimed Sarah Townsend, executive director of My Angel with Paws, when she opened up the check Friday afternoon at Stetson University’s Donor Relations House. 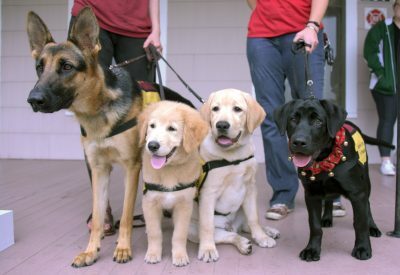 My Angel with Paws brought its service dogs to Friday’s event, including Palmer, far right, the Greenfeather puppy. Greenfeather is an annual tradition during Homecoming in which teams of students compete to win the most points during activities and fundraising. The goal was to raise $10,000 for the Greenfeather grant, and organizers said this year might be the most ever raised. “And put in handicapped parking,” added Marilyn Kudlets, president of the Board of My Angel with Paws. Sarah Townsend, executive director of My Angel with Paws, hugs Greenfeather Vice President Bianca Perito after opening the check for the Greenfeather Grant. 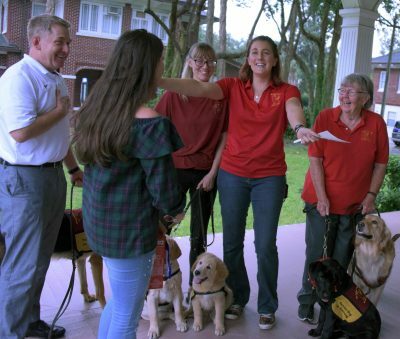 They gathered with their service dogs and Stetson students and staff on Friday as Greenfeather Vice President and senior Bianca Perito presented the check. The students kept the final grant award a secret to surprise the nonprofit. In addition to the grant, Stetson faculty, staff and students also donated enough dog food and pet supplies to fill six large plastic bins, said Rebecca Thomas, assistant director of Sustainable Giving and Greenfeather adviser. The winning Greenfeather team, Pi Kappa Alpha and Zeta Tau Alpha, had the honor of naming the Greenfeather puppy. They chose Palmer after Palm Court. The black Lab attended Friday’s event and, just six weeks after the competition, he already weighs 40 pounds. 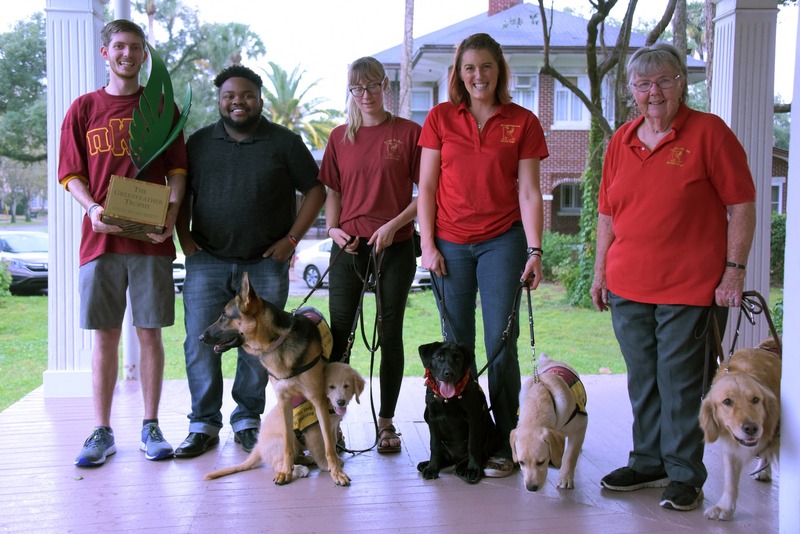 Brendan Haviland, left, external vice president of Stetson’s chapter of Pi Kappa Alpha (PIKE), holding the Greenfeather Trophy, and Elijah McCoy, Stetson’s Homecoming King 2018, joined in Friday’s check presentation to My Angel with Paws, Dec. 14, 2018.